(NewsUSA) - As a pet owner, have you ever had a female dog who always finds the outdoor bathroom during the day, but wets her bed at night? Dogs who follow the house rules can be horrified when they realize that they've leaked -- even though it occurs during sleep. Plastic sheets aren't the answer, and most likely your long-suffering pet wouldn't be happy alone outside. Urine soiling isn't something pet owners enjoy discussing. Many assume it's a behavioral problem, believing they've failed to properly train their pets. But poor bladder control following spaying is actually a physical disorder that's seen mostly in middle-aged female dogs, and can occur any time after surgery. In addition, it's more common in large breeds and those who struggle with obesity. To that end, a rolled-up newspaper won't solve this problem, and won't improve behavioral house soiling either. Leaking urine during rest or sleep is not your dog's fault. There is value in spaying your female dog, but giving up their ovaries means the sphincter muscle in the bladder can be left just weak enough to relax and release urine. It may happen any time they drift off. The result is a tell-tale wet spot on their bed. About 20 percent of spayed dogs face this messy downside. For dog owners who want to try and help their pet, the answer may lie in a liver-flavored tablet. Proin tablets can be given twice daily, and make a difference in both a pet and an owner's life because urine leakage can damage relationships. Consider this: 18 percent of the dogs in shelters were surrendered by frustrated owners because of house soiling. Alternatively, there are other possible causes, so it's essential to allow your veterinarian to make an accurate diagnosis before medication is started. Urinary tract infections are common, especially for indoor girls. Bladder stones can also cause house soiling. And elderly dogs may urinate indoors because of senile brain changes, a problem called cognitive dysfunction syndrome. Pets with urinary symptoms need to see their doctors. If a thorough exam and urinalysis come up normal, a healthy female dog who leaks only when resting or sleeping most likely has urinary incontinence due to reduced estrogen. You can explain all of this to your dog, ending "the talk" by telling her that she has urethral sphincter hypotonus. With her leader so well-informed, she is sure to feel better. Veterinarians like to uncover these cases because almost all of them can be turned from frustration to success. Proin is often chosen because it is the only non-hormone treatment option, and also because it's palatable and easy to dose. But in certain cases, due to pet irritability, restlessness, or medical conditions, Proin may be inappropriate. For those dogs, an old standby treatment -- a synthetic estrogen called diethylstilbestrol (DES) -- may be used. There are many undiagnosed female dogs struggling with nocturnal incontinence. The good news for spayed female bed wetters is that they can enjoy campouts and sleepovers just like everybody else. 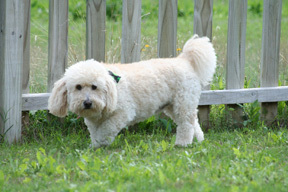 For more information on Proin, including important safety material, pet owners can visit www.proinforcanines.com.